I wouldn’t consider myself a fair weather cyclist. I have started rides in sub-zero temperatures, cycled through snow and torrential rain, fog and gusting winds. I must confess, though, on occasion to packing the bike away if I feel spots of rain as I’m leaving the house, or to sitting with my nose pressed miserably up to the lounge window watching the rain pour down for hour upon hour. It’s a truism to say that the most difficult part of a bike ride, especially a solo effort, is actually getting the bike out of the house or shed. On the occasion of me starting a ride in the pouring rain, I was in Bristol on the evening of Golden Saturday in the summer of 2012 about to start the Exmouth Exodus and it would have been churlish not to try and get part of the way there. In October last year I pushed the boundaries of my resolve – I was at Epsom Racecourse for the Cycling Weekly Box Hill Original and the weather was living up to it forecast. Persistent, driving rain had been falling most of the morning, the roads were awash and there was no sign of it getting any better. Yet, while I was signing riders on for the Sportive, I was astounded to see queues forming at the desk for on-the-day registration. My lower sleeves were soaked from wiping helmets and mopping puddles up from the sign-in sheets, but there was a happy determination amongst those preparing to take on the Surrey Hills as they were metamorphosing into a wet and wild water theme park. I myself was prepared for the squalls with thermal long tights, many base layers, shoe covers, waterproof socks and a patented waterproof jacket, but still didn’t entertain the thought of finishing the first 30 minutes with anything short of all-over saturation. I had brought my winter bike, replete with mudguards destined only to shelter those behind me from extra soaking from surface water – I think all of the mud in Surrey had been washed into the River Mole. 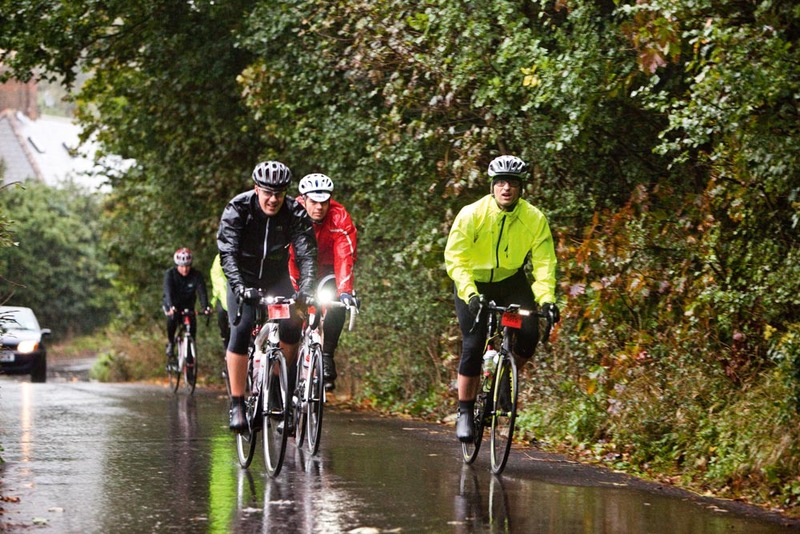 Once you embrace the misery and warm your core up, cycling in the rain isn’t really such a chore – it’s often uncomfortable and occasionally dangerous but attention to clothing choice and road conditions can help you to avoid the local Walk In Centre and, dare I say it, you begin to enjoy yourself. At the 10km mark I got a puncture, which explained the reason for the bike’s skittish behaviour, having found that my rear tyre had minimal pressure in it. Cornering and descending began to be less and less of an occasion for soiling my underwear. Travelling familiar roads around my hometown help wile away the first hour or so, and give me the confidence to push on through the puddles and gravel-strewn roads. The first (and for us, only) feed station was a welcome relief as I’d left my drinks bottle behind on the kitchen side, having had to rehydrate by riding open-mouthed. I could have squeezed water from my gloves straight down my throat. As the course split came nearer, and the rain stubbornly refused to abate, the decision was made to spurn the delights of the longer ‘Standard’ route and turn for HQ via a descent of Ranmore Common and a trip up the Zig Zags to the top of the eponymous summit of out ride. There were still many cyclists out on the road and although their faces were streaked with mud and grime they were all, like me, smiling – albeit some in the same way you would if baronet’s dog was getting over-friendly with your leg at a garden party. Notwithstanding the dog metaphor, it was all rolling terrain from Box, except for a climb up to Walton on the Hill (clue’s in the name) and a couple of bumps through Tadworth before we could all see the glorious sight of the race course. Over 1300 cyclists braved the elements and the handicap of carrying up to an extra kilo in rainwater up the inclines, a significant number of which did the 120km course, but the sense of achievement was fantastic and bragging rights had been secured for the winter over those that had stayed home and watched the Japanese Grand Prix on the TV in their pajamas, eating bacon sandwiches. For some inexplicable reason I hadn’t brought a change of clothing with me so I had to spread towels over the seat of my car, set the heater on to ‘volcanic’ and squelch my feet into my trainers for the short drive home to a hot shower, an even hotter mug of tea and a well deserved sticky bun.